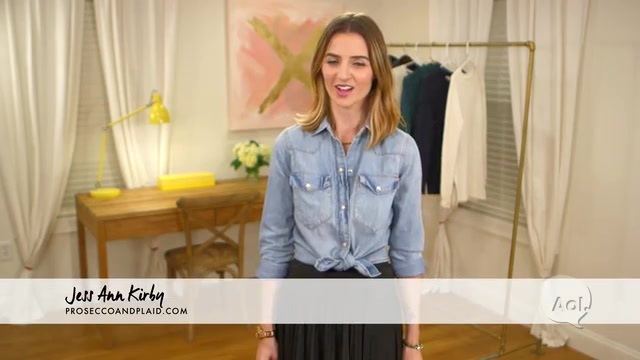 Today's post is all about styling, not just a chambray top, but an open back top, too. Well guys, the good news is that it really isn't too hard, especially with nice weather :) Continue below to read more of what went into my styling! To start, I paired this loose top with tight jeans, to contrast the boxy shape. I opted for white denim, but a solid blue jean or black denim would work perfectly, too. I kept the look minimal by adding just neutral, but unique and bohemian-inspired pieces. From the front, the accessories make a statement. From behind, the back moves with the wind and shows off just a pinch of skin! It's a simple summer outfit, but the flowy style of each piece gives off a great bohemian vibe. This Zara chambray top is so playful. I love that it's really loose and casual, with a bit of a surprise in the back. You know what they say... business in the front and party in the back ;) But really, it's a great summer top and, though the same shirt isn't available anymore, there are many great options for you at the bottom of this post (like this and this!)! These woven Dolce Vita booties are to die for, aren't they? They're so edgy, bohemian, and sleek at the same time. They're actually super comfortable, too, and they transition between seasons so well. I always wear them with my fringe bag (oops), because they're a perfect match and both interesting. I don't usually wear boxy tops since I already have curvy hips, but when they come with a playful back opening, I certainly can;t pass them up! What do you all think? Would you wear a boxy, open-back shirt like this? If so, what would be your styling of choice?